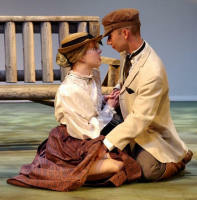 Chekhov’s play is about a family attempting to maintain their aristocratic values in an increasingly bourgeois world. The Ranevskaya finances are so precarious that their large cherry orchard must be sold in order to maintain the rest of their estate. Each member of the family realises the necessity of raising money, but no-one can bear to sell the orchard. To each of them, the orchard symbolises in different ways the happiness of a lost past. 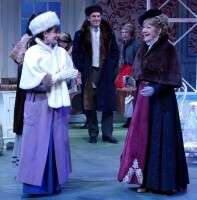 To Madam Ranevskaya – a time when she was young and innocent. To Gaev, her brother – a time when he was a carefree gentleman farmer, more interested in billiards than banking. To Lopahin, now a merchant, once a serf – a time when love and loyalty were more important than material success. 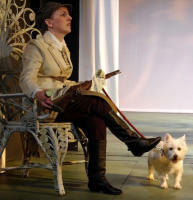 Throughout the play, each character can see the impracticality and blindness of the others, but is blind to his own folly. Inevitably, the whole estate is sold. The Ranevskayas set out for new lives, taking their old-fashioned, sometimes ridiculous values with them. These themes are the essence of the play. 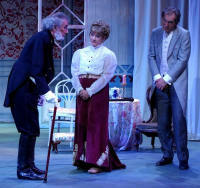 The cherry orchard, for Checkhov, symbolises his beloved Russia, the Ranevskaya household the ruling-classes. Consequently, we need to recognise the motivations of each character if we are to understand what Chekhov is trying to tell us. 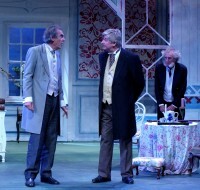 Additionally, Tom Stoppard has brought his trademarks – clever wordplay, comic moments – to develop Chekhov’s themes for a new audience. 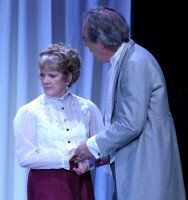 Brenda Cottis’s fine production had much to commend it. The visual elements were terrific – Pattie Jones’ artistry on a convincing set, excellent lighting from Ed Hopkins, and wonderful costumes from Lyn Chatterton (just very occasionally let down by, for example, Trofimov’s sharp modern-looking creases to his trousers). 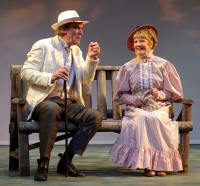 I particularly liked the simple setting in Act 2, outside on the estate – a single bench, with beautiful, atmospheric lighting. 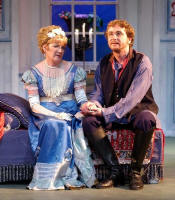 Sally Marsh gave a very solid performance as Madam Ranevskaya, but I was not totally convinced of her deep love, indeed passion, for the cherry orchard. On occasion I felt that she was more inclined to rush back to Paris. 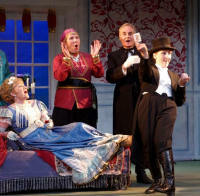 Her role is pivotal to the play, and her character demands great presence and conviction. I particularly liked Peter Simmons as Lopakhin; he convinced me that he had come good, from humble origins. Cathy McCluskey shone as Varya; her scenes with Anya (Fran Burgoyne) were very sensitively played; a little more evidence of her warmer side would have contrasted well with the hardness of heart that she needs to show later. Scott Brindle impressed as the eternal student Trofimov, with strong characterisation and an assured vocal quality. Gaev, amusingly played by Barry Brown, showed a wonderful disinterest in the prospect of succeeding as a financier. There was a fine comic performance from Tony Stafford as Firs. 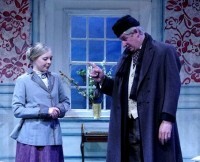 I felt, though, that other comic opportunities could have been developed further: Hugh Mellor as Pishchik, forever scrounging money, and Kathy Wholley as the Governess provided gentle humour, but could have delivered more. 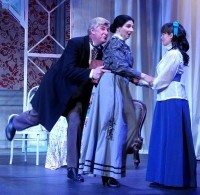 Neil Coates’ clerk started well with his squeaky boots, but needed a bit more vigour in his pursuit of Anya. 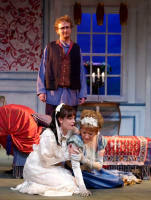 Sarah Middle, as Dunyasha, gave a confident performance, as did Ian Nutt as the manservant Yasha. 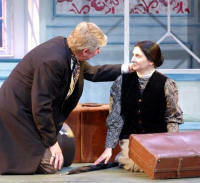 I liked the device of the scene-changes being managed by the servants, who reappeared in the final moments of the play to remove the luggage. They looked the part, and made the interludes fun to watch. Although I did feel that there were greater depths to achieve, there was so much to enjoy in this production. 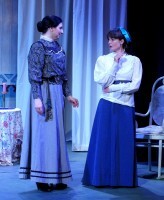 Congratulations to Brenda Cottis and her team for delivering an impressive staging of a very difficult play.